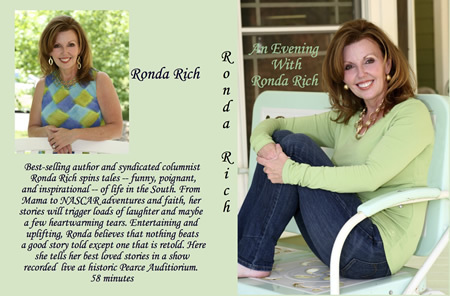 Best-selling author and syndicated columnist Ronda Rich spins tales -- funny, poignant, and inspirational -- of life in the South. From Mama to NASCAR adventures and faith, her stories will trigger loads of laughter and maybe a few heartwarming tears. Entertaining and uplifting, Ronda believes that nothing beats a good story told except one that is retold. Here she tells her best loved stories in a show recorded live at historic Pearce Auditorium.